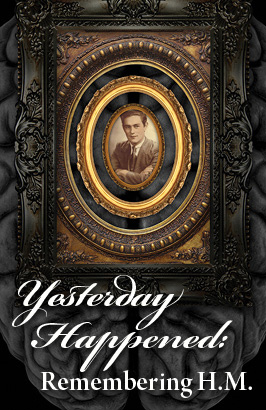 Catalyst Collaborative@MIT, a science-theater collaboration between Underground Railway Theater and MIT, will present the World Premiere of "Yesterday Happened: Remembering H.M." at Central Square Theater, 450 Massachusetts Avenue in Cambridge. Written and directed by Wesley Savick, the production will run April 12 - May 13. At the age of 27, Henry Molaison became frozen in time. After experimental brain surgery, H.M. (as he was known to the scientific community) was unable to form new memories. His amnesia was “pure,” and his case initiated modern memory research. H.M. was studied by scientists from after the surgery in 1953 until his death in 2008 at age 82. Molaison's personal tragedy ultimately became neuroscience’s golden opportunity, contributing more to the understanding of the brain than had been learned in the previous 100 years. A scientific detective story, "Yesterday Happened" explores the mysteries of this moving story, expanding on them and helping us better understand ourselves. Although H.M became the most studied man in the history of medical science, he was completely incapable of knowing how famous he was. He was incapable of personal change, yet he profoundly changed the world's understanding of memory. He could not retain names or new vocabulary, and yet he sustained a life-long addiction to crossword puzzles. His story is not only strange, but also deeply moving. "Yesterday Happened" has been created through conversation with those who studied H.M., with added inspiration from research study transcripts. Sections of the play are word-for-word accounts of interactions between scientists and H.M.. The play reveals H.M. as he deals with the perils of everyday life, relates his dreams and even sings. Last month, excerpts from "Yesterday Happened: Remembering H.M." were performed at the American Academy of Arts & Sciences, followed by a panel including Dr. Suzanne Corkin, Professor of Behavioral Neuroscience at MIT. For information and tickets, call 866-811-4111 or visit CentralSquareTheater.org.